A day after Guns N’ Roses guitarist DJ Ashba offered up the latest excuse for the band’s notorious concert tardiness (here), the promoter of the band’s upcoming Australian tour has promised that Axl Rose will be on time for the shows. 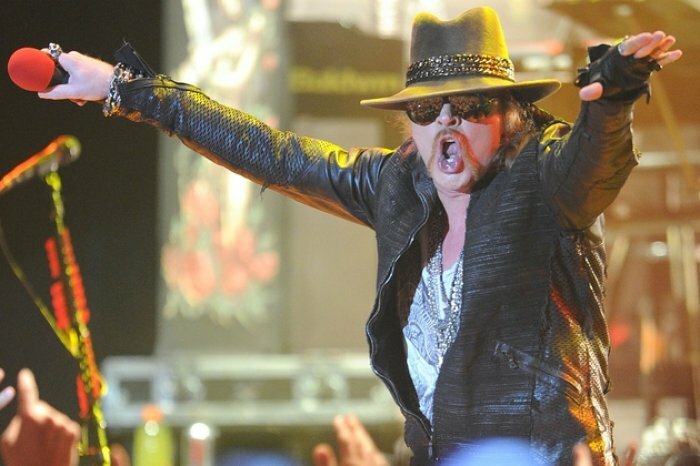 "Axl will be on stage on time, so any of those fairyheads saying he won't be, good luck!" Andrew McManus tells Sydney’s Triple M.
Axl has long been hammered for being being late on stage, sometimes up to two hours late, but McManus says he's got his act together. "The great thing is that the last 12 months he's been on stage on time. I can guarantee all the punters that do go, he has been exemplary," he said. "He'll promise you, he'll be on stage at the right time, so don't be fearful. [If] you rock out there two hours late and think you're going to see him... the show will be over." News.com.au reports Melbourne’s Sidney Myer Music Bowl has a strict curfew of 11pm to pacify neighbours who have complained about noise from previous events. Rose would need to be on stage by 9pm - which has been a challenge for him in the past, often leaving fans waiting for up to three hours. On previous tours of Australia, promoters have pre-paid late fees at indoor venues where Rose would regularly come on stage at 11pm or even midnight. GNR last toured the country in 2010 but only played shows in Townsville (they were 2 hours late), Sydney (1 hour late) and Adelaide (1.5 hours late). Joining GNR on the Australian tour in March will be special guests ZZ Top and Aussie rockers Rose Tattoo.